The 69th National Guard Regiment was founded as a militia regiment in New York State in 1849 by Irish patriots who had fled Ireland after the failed rebellion of 1848. The regiment fought for the Union during the American Civil War (1861-1865), and it won its nickname “The Fighting 69th” during the Seven Days Battles. Although most units of the Union Army were disbanded when the war ended, the regiment became part of the New York National Guard, while retaining its Irish-American nature. It was called up for active service during the Spanish-American War (1898) and the Punitive Expedition against Pancho Villa in 1916 during the Mexican Revolution. When the United States entered WWI in early 1917, the regiment would expand from its reduced peacetime size, so the officers concentrated on recruiting soldiers with an Irish background to ensure that the unit retained its Irish nature. The regiment was assigned to the newly formed Rainbow Division, composed of National Guard units from every state in the nation, which would be one of the four divisions of the American Expeditionary Force that would sail to France in the fall of 1917. When the United States enters WWI in April 1917, the 69th National Guard Regiment, a famous Irish-American unit, is one of the first units to be sent to France. As it expands to its war time strength, a group of new recruits joins the regiment at the division’s training camp. Jerry Plunkett (Cagney), one of the recruits, has a serious chip on his shoulder, and does not share his fellow soldiers’ devotion to the cause of freeing Ireland. Even though everyone hates Plunkett, popular chaplain Father Francis Duffy tries to reach out to him. After spending the winter training in France, the 69th is sent up to the front in mid-February 1918 to work with French units to gain experience. A bored Plunkett provokes the Germans into shelling the line, which causes heavy casualties. Shocked to discover that even the toughest man can not avoid a shell, Plunkett becomes overcome by fear. Unable to cope with his mortality, he constantly dodges any duty at the front, but reverts to being a tough guy as soon as he is safely in the rear. Major William Donovan, the battalion commander, wants to transfer him out but Duffy persuades Donovan to keep him. Plunkett is given another chance just before the regiment takes part in the Meuse-Argonne Offensive and finds itself fighting the enemy at the Ourcq River. 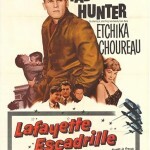 Despite Duffy’s attempts to convince the troubled soldier to embrace faith to conquer his fear, Plunkett knows that faith can’t stop a bullet. When his fear brings about the death of several soldiers, he will have to face the consequences of his actions, but he is offered one last chance for redemption. 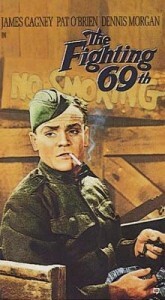 Although Cagney is shown joining the regiment along with a batch of civilian recruits, the regiment was actually made up entirely of members of various National Guard units. 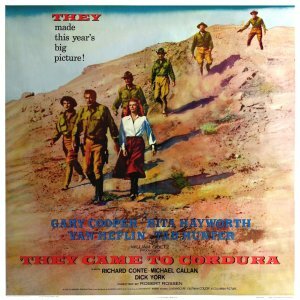 The screenplay gets the basic facts right but the regiment’s story is pushed to the side in favor of a chaplain’s struggle to save a single man’s soul. Hard to believe as it may be, but a Jewish soldier did change his name to an Irish name to win entry to the regiment. The Germans are presented as weak opponents, who are skilled at using machine guns and artillery to kill but always run away when faced with any resistance, which makes one wonder why WWI lasted so long. One battle scene consists of men from the 69th charging across No Man’s Land and the Germans surrendering as soon as the Americans reach the trench. The real soldiers probably wished that it had been that easy. The stagey scenes at the front refer to the killing and slaughter, rather than show the violent fighting. Only the final battle scene comes close to conveying the terrifying carnage of trench warfare in WWI. The real Donovan was a top-notch battalion commander, who would form the OSS during WWII, and the screen Donovan does portray his determination to make his men ready for war. However, the actual Donovan knew that he was responsible for a battalion, so he never went up with a single officer to try to capture prisoners for interrogation. Duffy was genuinely popular with the soldiers because he was always concerned about their welfare, both moral and physical, while his constant calm was very reassuring. The fictional Duffy confines himself to preaching and giving men their last rites. The battle at the Ourcq River lasted for three days, and the real Duffy spent the entire time either crawling from foxhole to foxhole to encourage the men to fight or carrying wounded men on stretchers, which seems more deserving of screen time. However, the film does capture the chaplain’s good relationship with men of all faiths. Cagney’s character was based on Private Tom Shannon, from County Clare, Ireland. A heavy drinker and trouble maker, he had received three convictions for being AWOL since first entering the regiment. In France, a friend tried to buy some potent alcohol from a distillery operated by a priest but was refused because he did not have enough money. A drunken Shannon fired his rifle near the priest but was observed by the corporal of the guard, who found a spent shell in his rifle. The court-martial recommended a dishonorable discharge, but regimental tradition says that Duffy persuaded the commanding officer to let him remain in the regiment. A tough, fearsome man, Shannon was badly wounded while trying to knock out a machine gun nest during the Battle of the Ourcq River and died from his wounds. 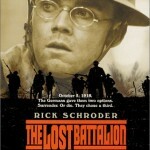 The film was intended to motivate Americans to enter WWII by appealing to their patriotism. While the story is a bit hokey, it is saved by Cagney, who deserves credit for showing the fear of a man who realizes that it is impossible to ensure that he avoids death on the battlefield. However, the relentless piety of the screen Duffy is a major weak point. Instead of the insufferably noble version played by O’Brien, the real man had a forceful personality and was far from meek. Fixated on having an Irish officer command the regiment, the chaplain spent much of the war scheming to arrange for Donovan to be appointed commanding officer of the regiment. In fact, there is no mention of Duffy’s obsession with preserving the Irish nature of the regiment. Most important, it seems completely unlikely that the real Duffy would do so much for a man who had caused so many deaths. How many innocent men had to die to convert Plunkett and save his soul?